This book is amazing. Simply amazing. Long-time Lone Ranger fans will appreciate that Mr. Hopkins keeps the characters intact here, while putting a more adult spin on the legend. This is what the movie should be like. Sadly, Howard is no longer with us, but this book is, arguably, his crowning achievement in his excellent body of work. I encourage anyone who loves a good Western and the character of The Lone Ranger to go purchase this book immediately! Great theme and good reading. However, after a consistent pace, the ending was way too rushed. Too mature for children. In an attempt to take away some of the straight shooter, super clean heroics of the original, the character becomes somewhat pointless to the story. I found myself at the end of the story asking what the Lone Ranger really did here and the answer is not much. I'll have to go with the negative reviews on this one. Vendetta was mildly enjoyable but ultimately unsatisfying. The villainness was the most interesting character. She was the kind of sociopathic serial killer we see in modern fiction, but not in Westerns. She'd sleep with anyone, then kill him (or anyone) if he looked at her wrong. The Lone Ranger and Tonto seem two-dimensional to me, at best. 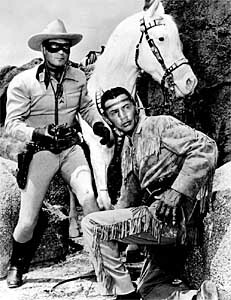 At least Tonto is more or less a full partner to the Ranger, not a sidekick. Still, it's the Ranger's story, so Tonto gets less exposure, as usual. Apparently this Tonto is the original Potawatomi version. He does have a couple of good moments. At one point, they're sitting by a campfire at night. The Ranger asks Tonto what he sees in the flames, leading to this exchange:TONTO: I see ghosts, Kemosabe. TONTO: The ghosts of the Bodéwadmi, the keepers of the fire. They ride with frozen thunder across the black sky forest, the way they once rode the trails and plains. Proud. Free. The world closed in on them and now they are nearly gone. I feel their isolation, their separation from the soil and the lands. They scream their silent pleas to Kichimanido.This may be the longest speech Tonto has ever uttered. It's also the first time I recall his referring to his particular culture, not a generic culture. It's noteworthy for both reasons. A posting explains that Bodéwadmi is the Indian version of the Anglicized name "Potawatomi." So Tonto is really talking like a Potawatomi, for once. On August 29, 1821, the Bode wad mi, Odawa and Ojibwa ("The People of the Three Fires") held council with representatives of the United States government and signed a treaty, which left them only five reservations, and certain land grants in Michigan. Many were moved to Oklahoma and Kansas territories. Those who would not leave were driven out by military force or hid away from the government. Small bands traveled to Northeast Wisconsin, the Upper Peninsula of Michigan and Canada. All of the Anishinabe (Bode wad mi, Ojibwa and Odawa) lived in the eastern part of North America. After various wars and migrations, the tribes moved to the Great Lakes Area. The oldest brother, Chippewa (Ojibwa), was given the responsibility of Keeper of the Faith. The middle brother, Ottawa (Odawa), was the Keeper of the Trade, and the youngest brother, Potawatomi, was responsible for keeping the Sacred Fire; hence the name, "Keeper of the Fire." Long ago, the Potawatomi depended on nature to survive. They lived a nomadic life. They hunted, fished, grew crops and gathered food to eat. After they were forced onto reservations, they lived through years of poverty. At times during the early 1900s, they hardly had enough to eat. The early Potawatomi people were a part of the Eastern Woodlands group of Native Americans. By many accounts, the people were fairly short with a stocky build. They were a fun-loving people who enjoyed practical jokes. Women were modest in both the clothes they wore and in their actions. The men and women both normally wore their hair long. During times of war, the men shaved their heads except for a small scalp lock on top. Women usually wore their hair in a single braid down their backs. The Potawatomi’s love of nature and family was at the center of their way of life. This is evident throughout their early history, through their spiritual lives, and in all other areas of their village life such as their food, clothes, homes, tools, and transportation. The Potawatomi people wore clothing that was very simple. During the summer, the men often wore clothes made out of red or blue cloth. In the winter some wore decorated buffalo robes. To keep warm during the winter, men wore leggings made of buckskin or cloth. They also wore these for special dances. When playing games like lacrosse, men wore breechcloths and deerskin moccasins. After the hunters returned with the animals they had killed, the hides would be removed and then women would prepare the hides so that clothing could be made from them. Much of the Potawatomi clothing was made from these hides. Women wore knee length dresses with petticoats underneath. They sometimes wore bonnets or scarves on their heads. They made their skirts and sleeveless dresses so that they draped over their shoulders and were held in place by a belt at their waist. If they needed to sew pieces together, they used thread made from plant fibers or strips of hide tied in place. These clothes were often decorated with different designs using porcupine quills or beads. Men and women greased their hair and painted their skin for special occasions. Men tattooed their bodies with different designs. You can see that Tonto doesn't look much like this description of Potawatomi men. But the main point is that the Potawatomi have a distinct culture that isn't Lakota, Apache, or anything else. And for the most part, the original Tonto and this Tonto aren't wildly inconsistent with Potawatomi culture. Alternate spellings: Gichi Manidoo, Gchi Mnidoo, Kichi Manido, etc. Gitchi Manitou is the great creator god of the Anishinaabe and many neighboring Algonquian tribes. The name literally means Great Spirit, a common phrase used to address God in many Native American cultures. As in other Algonquian tribes, the Great Spirit is abstract, benevolent, does not directly interact with humans, and is rarely if ever personified in Anishinabe myths--originally, Gitchi Manitou did not even have a gender (although with the introduction of English and its gender-specific pronouns, Gitchi Manitou began to be referred to as "he.") It is Gitchi Manitou who created the world, though some details of making the world as we know it today were delegated to the culture hero Nanabozho. "Gitchi Manitou" (or one of its many variant spellings) was used as a translation for "God" in early translations of the Bible into Ojibway, and today many Ojibway people consider Gitchi Manitou and the Christian God to be one and the same. Gitchi Manitou is the great creator god of the Anishinaabe and many neighboring Algonquian tribes. The name literally means Great Spirit, a common phrase used to address God in many Native American cultures.I'm not sure Tonto has ever referred to the "Great Spirit" or "Creator" before. I'm pretty sure he's never referred to Gitchi Manitou before. So that's another first. There's even a partial explanation for what Tonto is doing in Texas. His people were driven into Oklahoma and from there he roamed the Southwest. None of this is in the Lone Ranger mythos, but we can imagine it. That one paragraph is about all the culture Tonto expresses, so it isn't much. But compared to other versions of Tonto, it's a step forward. As you can see from the quote above, Tonto's speech is more or less normal. Later, he notes how he speaks "Tonto style" intentionally--to fool the white man into thinking he's dumb. That's a brilliant explanation of Tonto's speech pattern. All future creators of Lone Ranger stories should adopt it immediately if they feel the need to make Tonto sound "tonto" (Spanish for "dumb"). Unfortunately, the villainess captures Tonto and uses him to lure the Ranger. It isn't Tonto's fault; he's rescuing someone in a hotel room when she stumbles across him. But we end up in the same place as so many other Westerns--with the white man as the hero who has to save his Native friend, sidekick, or maiden. In short, I'd give this book about a 7.0 of 10. Unless you're a Lone Ranger fan, you can safely skip it. For more on Tonto, see Skyhawk: Depp Dishonored Indians and 33 Tonto Comic-Book Covers.